Personalised Brownies Hand delivered to you. Our personalised brownies are some of the best in the UK, with 9.7 out of 10 Trustpilot rating. It’s all due to our high-quality ingredients, attention to detail and all of them being hand-delivered to ensure they’re perfect every time. Customer service is one of the core pillars of our business and we are around to answer your calls and emails whenever you need us. These 1000 personalised Brownies comes with your logo printed directly on to a white fondant disc. Perfect to attract new customers, treat your team or for a corporate event. Plus, they’re all produced in our wholesale bakery to ensure the highest standards. We hand-deliver each of our branded Brownies in our electric cars, so we can reduce our impact on the environment, but also ensure that they get there on time and in great condition. We recently completed an order for 7,000 cupcakes delivered to 39 locations, all before midday. A 7-day notice is required for order, but if you need it sooner give us a call on 01525 839963. 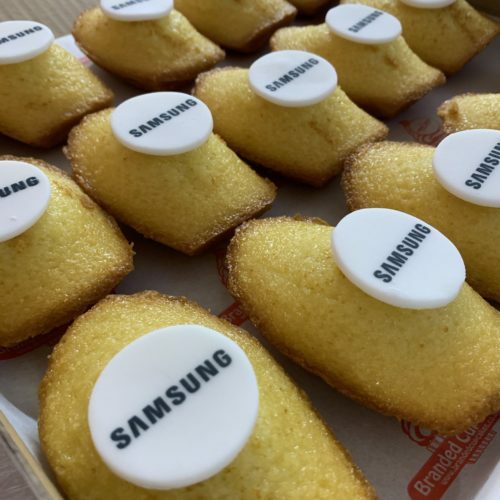 If you’re looking to wow people with your branded Brownies, we also offer a whole range of personalisation. We can create any shape brownie you require. Square, rectangular, circle or even a heart. Plus, we have recently introduced both a vegan and gluten-free option, so all your customers can enjoy a cupcake. We can produce 10 to 100,000 branded brownies in our wholesale bakery, so no order is too big or small. We take the same amount of care over every order and every cupcake. WANT MORE OPTIONS? CALL 01525 839963 OR REQUEST A QUOTE FOR YOUR CUSTOMER ORDER HERE. I needed to source good quality branded cupcakes for an event at a reasonable price and fairly tight timescale and Amore Bakery totally delivered! The cakes arrived hand delivered and completely unspoiled. 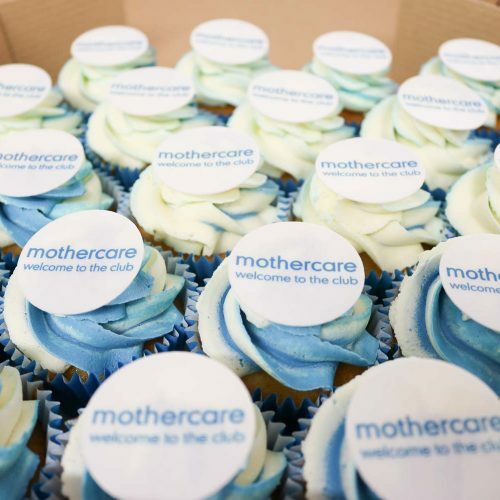 They managed to match the colour of the icing to our logo perfectly and they had such a great impact on staff. They even tasted amazing! I can’t recommend them enough. Thank you for helping our event be a success!